There's more than meets the eye in the citizenship case of Pleasant Cumiford. While Watt Christie tried to downplay his role in citizenship cases by claiming he often didn't know what he testifying to, this can't be true in the Cumiford case. Christie gave oral testimony in that case. He had to know what he was testifying to, under sworn oath, because it came out of his own mouth, in his own language. In Christie's testimony, he admitted he and Cumiford talked for a while. Christie said that was when he recognized Cumiford as his kin, the son of Rachel Fisher. Is it possible this conversation is when the two men set their plan in place to get Cumiford a Cherokee citizenship? 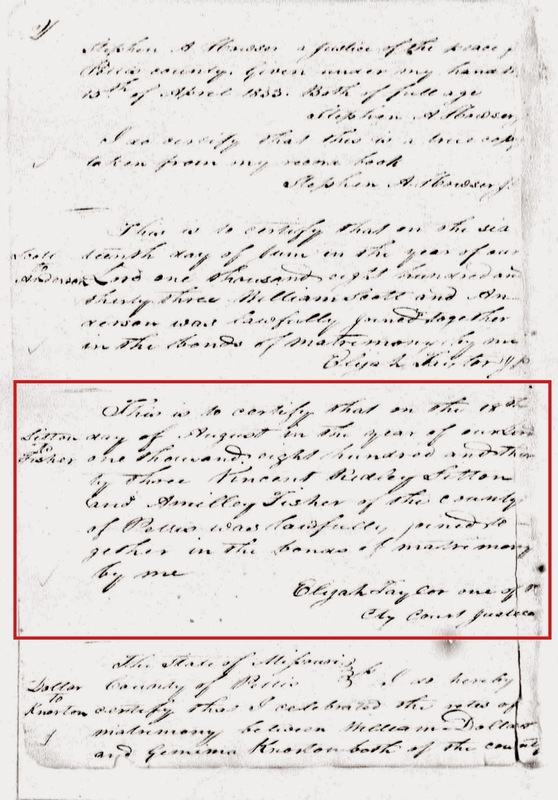 At some time, the two men must have conspired to blend the history of two families in order to make Cumiford appear to be a Cherokee.While it is possible, it is not probable, that the surname Fisher was an impromptu choice by Christie. It would have been quite a coincidence considering Pleasant Cumiford's mother's mother was a Fisher; not a Cherokee Fisher, but a Fisher, nonetheless. Pleasant's mother, Mary E. Sitton, was the daughter of Vincent Ridley Sitton and Amilly Fisher, who were married August 18, 1833 in Pettis County, Missouri. 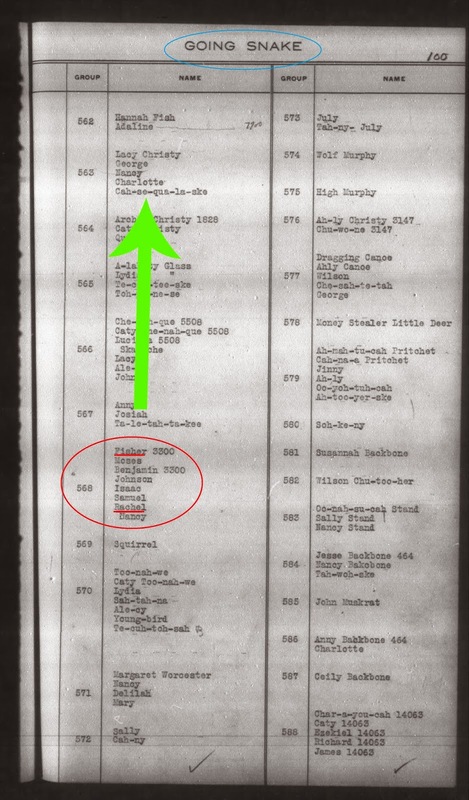 Knowing this is enough for us to realize this Fisher family could not have been the one Christie gave many details about because he said Rachel Fisher's family lived near Turnip Town on Ellijay before the removal and that they went to Indian Territory with the emigrants. If true, that means they were in the Cherokee Nation East until late in the year 1838. Cumiford's maternal grandmother was in Missouri five years before the removal, as seen in the marriage record above. Except for the surname of Cumiford's maternal grandmother, everything Christie shared was about a different family, an authentic Cherokee family. Christie elaborated in his original testimony by saying Rachel's father was named Fisher and her family lived in Goingsnake District after the removal. On the page below, taken from the Drennen Roll, see family #568. The head of the family is "Fisher". Listed later is a family member named Rachel. They were living in Goingsnake District, not far from Watt Christie's father, Lacy. In 1838, Fisher was a witness in a claim his mother, Ailcy, made against the US government for losses. Ailcy lived in Turnip Town. Fisher lived near Turnip Town on Ellijay. This is verified again with Fisher's own claim in 1838 that said he lived on Ellijay. Remember, Christie said Cumiford's mother's family lived near Turnip Town on Ellijay. Later, Fisher (aka Fishing Hatchet) filed a claim in 1842 and said he removed from the east with the Elijah Hicks detachment. Lacy Christie's (Watt's father) family also traveled with this detachment. Notice the name of the witness on Fisher's claim - Wattee. 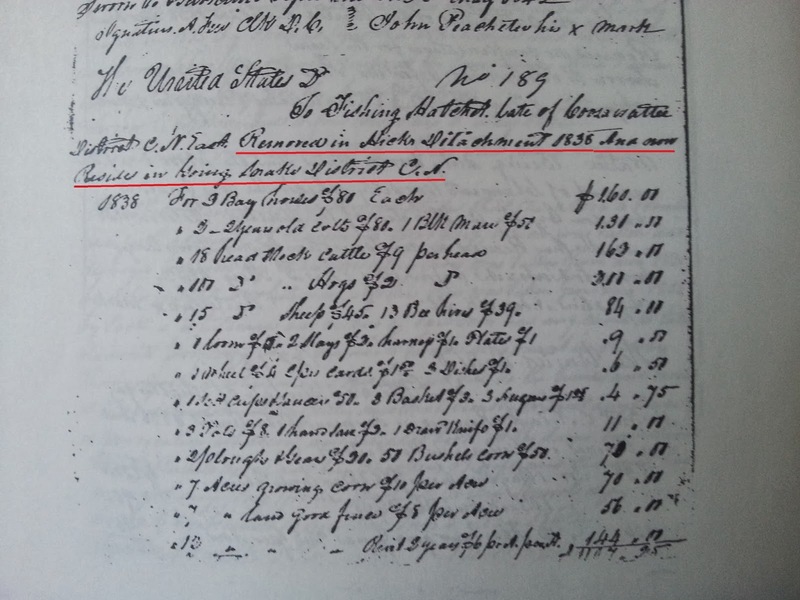 Coincidence that Watt Christie's name in Cherokee is Wa-de? Maybe or maybe not. Since they were kin, it is quite possible Christie was a witness for Fisher. The devil is in the details, folks. 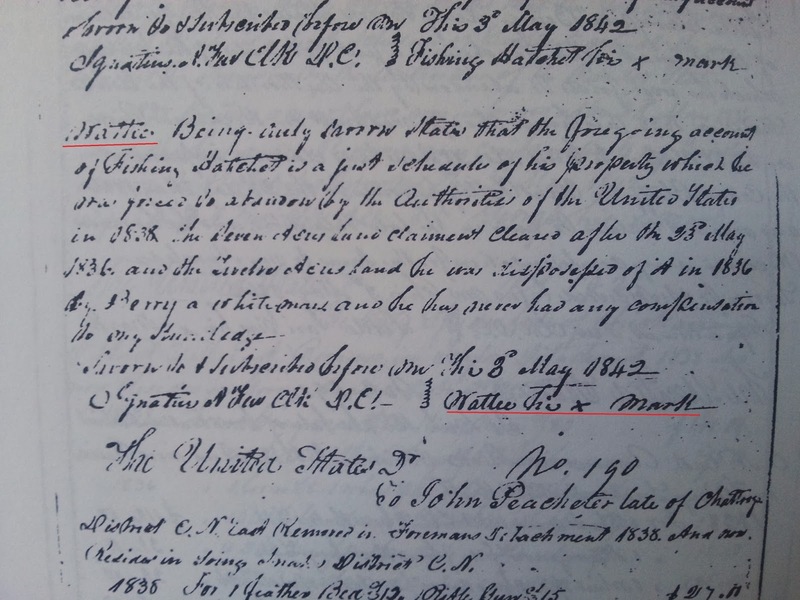 Watt Christie furnished all the information needed to bamboozle the Cherokee citizenship court and he did it by presenting facts about a real Cherokee woman and her family. He would have had intimate knowledge of the family he helped Cumiford steal because, not only did he live near the family, in both the old and new Cherokee Nations, but also because he was related to them. Rachel's father was named Fisher. Rachel's family did live in the Goingsnake District after the removal. Rachel's parents did live near Turnip Town in the old Cherokee Nation East. Rachel's family left the Cherokee Nation East in the fall of 1838. But Rachel was not the mother of Pleasant Cumiford. Rachel Fisher was the mother of many children, but Pleasant Cumiford wasn't one of them. It is unlikely Cumiford realized, that while he was living in the Cherokee Nation enjoying citizenship, Rachel was alive and well and living in the Cherokee Nation too. Unfortunately, she was unaware of the fraud being perpetuated against her and therefore could not have done anything to prevent it. Stay tuned for the next installments in the Standing Witness series where I share more about Rachel Fisher, her family and the fact she almost missed out on her Eastern Cherokee payment because of the confusion about her family.